How Do You Know If The Time Is Right? Feeling eager to buy a home, but not sure if now is the right time to become a homeowner? Raising buyers and sellers confidence in becoming a homeowner. NSH Mortgage has the wisdom and tools that can help you keep updated on new mortgage rates. It is easy to dream about owning and making your purchase desire come true. But it is not always easy to have the faith and self assurance that your timing is good. New data shows rising confidence from buyers and sellers alike. More players on both sides of the market thinks that now is the time to act. Knowing that many want to pull the trigger on a home purchase or sale, thus it will inspire others to do the same. It is important to trust your gut. But it is just as important to learn the facts about what you can afford and the mortgages available to you. This knowledge can also boost your confidence. 77% of people think that right now is a good time to buy a home; 48% believe this strongly. 62% of renters believe that now is a good time to purchase a home. That is up from 52% tallied last quarter and 60% one year ago. 80% of respondents who currently own a home, including those older than the age of 55, with incomes in excess of $100,000, those who live in rural areas, and those in the South and Midwest think that now is a perfect time to buy a home. 78% think it is a good time to sell a home. That is up from 63% measured one year ago. Those owning in the West (83%) are most likely to believe that now is a good time to sell a home. That Is Great Research: But Should You Take It Seriously? Jessica Lautz, NAR’s managing director of survey research and communications, says she is encouraged by many of these findings. The fact that 77% and 78%, respectively, think that now is a good time to buy or sell a home is significant. These are the highest scores we have seen since we have been keeping track, and with this it is increasing others confidence greatly. Seeing that others have the confidence in the market and that buyers have had successful transactions could push that momentum forward further. This can be specifically true for prospective buyers or sellers who may be on the fence and waiting things out. Robert Johnson, president/CEO of The American College of Financial Services, states that there is yet another reason why people are beginning to feel more confident about buying or selling today. They feel wealthier because the stock market has gone up over the past ten years. This gives them confidence that makes them believe now is a good time to buy or sell. Also, recency bias could be having an effect. This means we tend to overvalue the most recent time period. 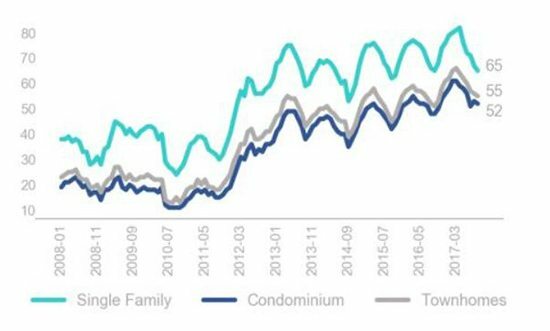 In addition, the most recent time period has been good for both financial assets and the robust real estate market. Another factor is at play, too. Perhaps most significant for buyers is that interest rates have been near historically low levels for an extended period of time. Many buyers fear that rates are likely to rise in the future. Thus, they believe that now is a good time to buy. They want to make a purchase before rates rise. Parsing The Data: Should You Become A Homeowner? The news that more owners think now is a good time to sell should be music to the ears of would be buyers. This could help loosen up inventory. It is another reason to be optimistic, as housing supply continues to be tight in many markets. She notes that many sellers will need to become buyers themselves after unloading their home. The fact that buyer confidence is up can make them feel more secure about selling and then purchasing. The finding that more people in the Midwest and South believe it is an ideal time to purchase should also interest buyers. We see that there is more affordable inventory in the Midwest than in coastal regions. Prices are not rising in the Midwest quite as steeply. Additionally in the South, there is more supply available and newer construction. That can lead to greater opportunities for buying. To improve your chances of buying a home sooner. Here are a few tips that Jessica Lautz recommends. Firstly, you will want to get your debt to income ratio (DTI) down. DTI is a your total amount of recurring monthly debt payments, including credit cards, student loans, auto loans and mortgages, versus your gross monthly income. Many lenders prefer a DTI lower than 43%. You can lower your DTI by increasing your income and reducing outstanding debt. Also, check your credit report and make sure there are no surprises there. Correct any errors you see. Save as much as you can toward your down payment, as well. Many lenders require a 20% down payment; some programs demand less, such as only 3.5% needed for a FHA loan. Be sure to consult with experts you can trust. Ask your Realtor and mortgage professional about affordable loan programs in your local community you may be able to qualify for. In addition, always be patient and remain realistic. Do not rush into any decision you are not quite sure of. Buying a home takes time. Make sure you look at prospective neighborhoods carefully and expect to have the competition for that perfect home. Lastly, be prepared to make sacrifices and compromises. We often find that recent successful home buyers have to compromise on one or more things, including location, price or size of the home.